The popular MCL1200 cantilever personal watercraft lift anchors the value line of MAX Lifts, and offers features no other PWC Lift does. It boasts left or right hand winch options, industry leading lifting height, vinyl over aluminum 8' bunks, upper and lower hinge stops, Nylatron® pulleys, and a corrosion resistant hardware package. The design technology and CNC machining that can be seen throughout this lift speaks volumes on the thought that goes into every MAX Lift. 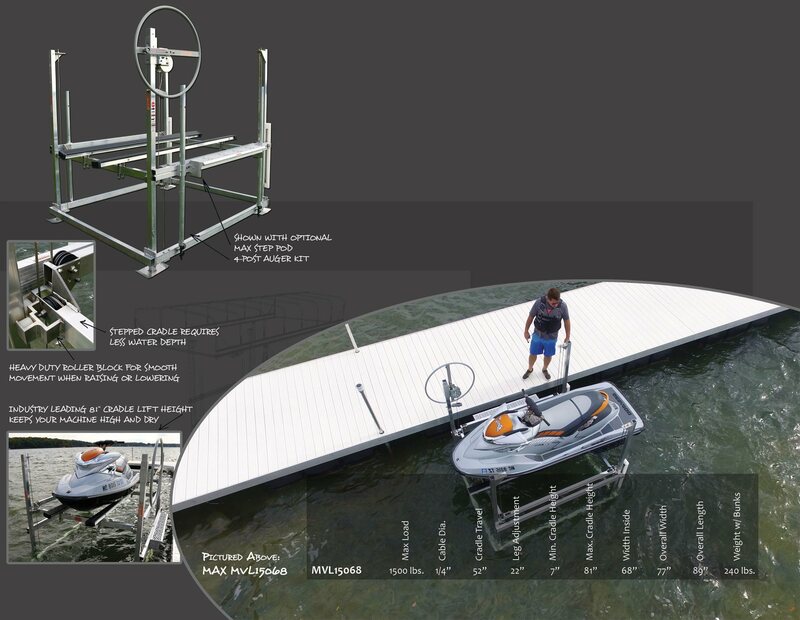 This all new MAX lift was designed to accommodate today’s bigger, heavier PWC's and small boats. It features one of the largest cradle lift heights in this weight class at 81 inches. The new stepped cradle design drops down to a mere 7 inches off the lake bed for shallow water applications. It features 36” adjustable lift legs, vinyl over aluminum adjustable 8 ft. bunks, all corrosion resistant fasteners, stainless steel cables, and Nylatron® pulleys. Optional accessories, like the MAX Stordry 14 ft. Canopy System with fabric adjusters, a Max tower mounted Step Pod, or a 4-Post Auger kit for high wind installations, makes this the most versatile lift in it's class for protecting your investment.